Here’s why I think it’s much better to share your struggles with fibromyalgia in a support group, rather than with your friends and acquaintances. To expect people who aren’t living with this condition to truly understand is to expect the impossible. This can invariably lead to frustration and disappointment. I realize everyone may not agree with me. That’s okay. This post reflects my personal perspective, and nothing else. I hope it’s not too controversial. I truly don’t mean to offend anyone. Venting can be healthy. To me, it just makes more sense to pick the time, place and person. I’ve lived with chronic pain for more than a decade. It’s something I don’t like to talk about, unless it’s with someone else who has the same problem. Fortunately, for me, my pain has lessened. The worst of my symptoms have receded. (Thanks to prayer, diet changes and natural remedies.) Now that my life is nearly normal again, I don’t like to draw attention to my problem. This might have had something to do with how severely I was affected. The muscle spasms in my lower back, and upper right leg, at one time, were so severe I could barely walk. There was no hiding the fact that something was very wrong. People constantly brought it up, asking if I was okay. I got sick of this, because I didn’t want to be pitied. Then, I’ve also been on the other side of the fence. I once spent time with another woman who had fibromyalgia. All she did was complain. And it got really tiresome. It had a very negative quality, and it made me uncomfortable. Eventually, I had to cut ties with her. I didn’t do this because she complained too much. I would never break off a relationship for that reason, because I realize that everyone needs to vent. For awhile, I went back and forth on whether I should cut ties. On the one hand, I liked her. I also felt guilty for breaking off a friendship. However, one night she lashed out at me, over a little thing. This wasn’t the first time she did that either. So I couldn’t remain friends with her. Every conversation left me uneasy. I knew then it was the right thing to do. 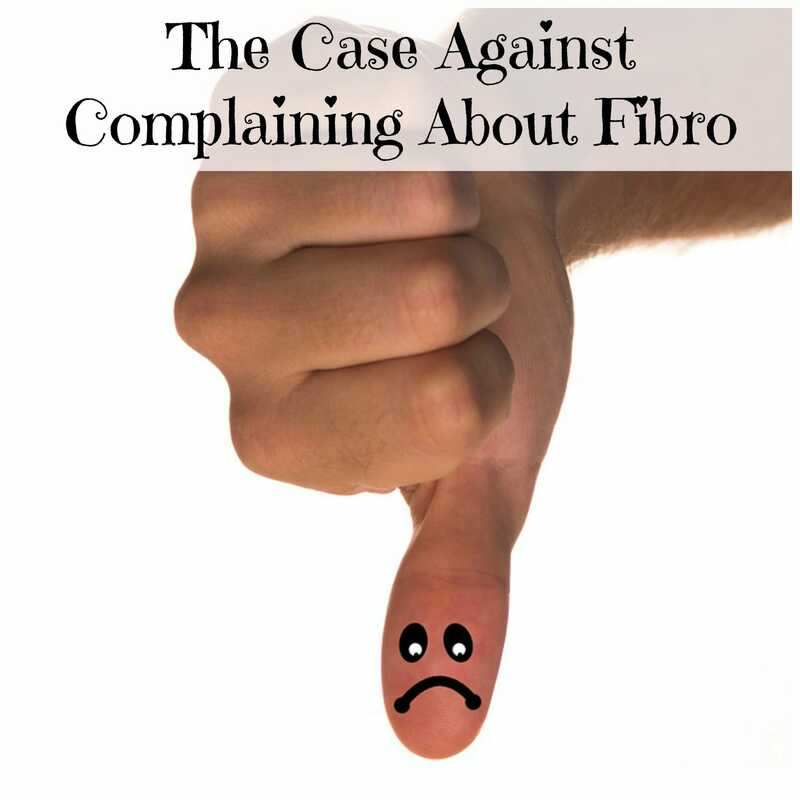 Should You Complain To Your Friends About Fibro? So I would never end a friendship just because someone complains a lot. I would try to listen and offer suggestions, to the best of my ability. Why I ended this friendship really had nothing to do with her complaining. It was the judgmental toxicity that I could no longer take. I never measured up, or did things the right way, according to her. So I decided she was not the kind of friend I needed. Nor did I feel I could trust her, given her propensity for talking about people behind their back. Part of my own recovery involves staying away from emotionally toxic situations. So that was why I had to go my separate way. Plus, she wasn’t a true friend. True friends don’t lash out at you repeatedly. Seeing this chronic complaining from a different vantage point made me firm in my resolve not to complain about my condition, not even to my husband. Seeing it from the other side made me realize that complaining about your health is not conducive to relationships. It may not kill the relationship. But constant chronic complaining isn’t a good thing. There’s a different between sharing and chronic complaining. Sharing is what friends do. Chronic complaining, especially while assigning blame to the listener) is quite another. There’s another reason too, why it doesn’t pay to complain excessively. In the long run, it hurts you. We only have so much energy to go around. And people with chronic illness have even less. So it makes more sense to channel that energy in a more positive direction. Seek solutions to your problems. Don’t expect them to just get better, all on their own. In any event, chronic complaining won’t make that happen. I encourage all of my readers to seek natural solutions to their health problems, while working closely with their doctor. I bet many doctors would be more than happy to offer holistic health advice, rather than to just prescribe drugs. Natural healing isn’t easy. It takes work. It will probably require a diet change. But taking control of my health was the best thing I did. You can read what I did in an-easy-to-understand online course that contains more than 20 videos, along with text. Click on the image below for more information.